Here’s look at the quick comparison between the Samsung Galaxy A8+ vs Samsung Galaxy A9. The Samsung has launched the world’s first quad rear camera setup smartphone in India on November 20. The Samsung chose to equip the quad camera setup for the very first time in its mid-range segment smartphone rather than introducing the feature on its flagship Galaxy “S” devices. The Samsung Galaxy A9 sports a 6-inch super AMOLED Infinity display and is available in two variants 6GB/128GB and 8GB/128GB. On the other hand, the Samsung Galaxy A8+, which features an edge-to-edge display and comes with a dual camera set up at the front is a pretty good device at the price, which it comes. Let’s compare the specification of these two devices to see what are the upgrades Samsung has done besides providing four cameras on the back. Starting with the display, the Samsung Galaxy A8+ comes with a 6-inch Super AMOLED display that offers a resolution of 1080 x 2220 pixels. On the other hand, the latest Samsung Galaxy A9 sports a slightly bigger 6.3-inch display that offers a resolution of 1080 x 2280 pixels. 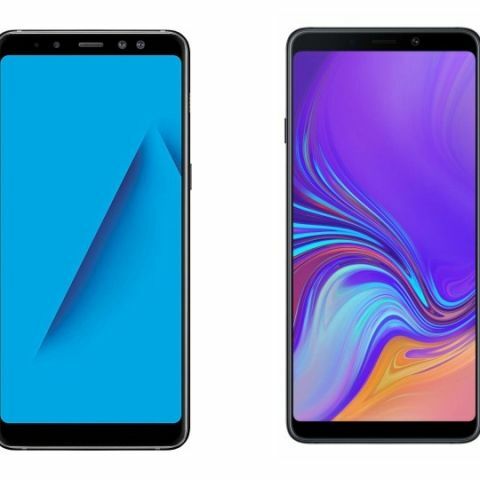 As you can see, the Samsung Galaxy A9 is bigger and better in terms of display in comparison to the Galaxy A8+. When it comes to the performance, the Samsung Galaxy A9 is powered by a Qualcomm Snapdragon 660 processor, while the Samsung Galaxy A8+ is backed by an Exynos 7875 octa-core processor. The cameras are one of the main USP of the Samsung Galaxy A9 as it is a first smartphone that features a quad camera set up at the back. It comes with 24MP + 10MP + 8MP + 5MP rear camera setup with a 24MP unit on the front. When it comes to the Samsung Galaxy A8+, the phone features a dual 16MP + 8MP front camera with a 16MP unit at the back. Overall on paper, the Samsung Galaxy A9 looks better than its predecessor. Some upgrades are major, while others are noticeable such as a display. 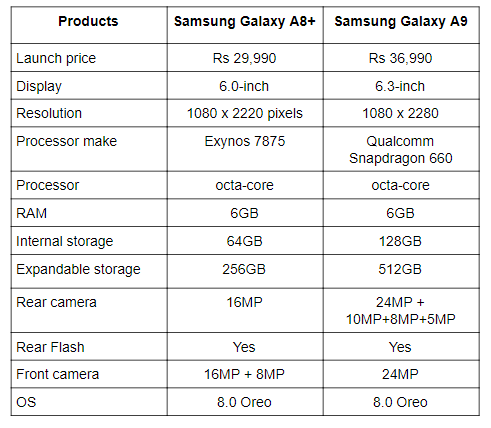 However, the Samsung Galaxy A8+ is almost Rs 7,000 cheaper than the Galaxy A9. The device is available on Amazon for Rs 29,990, while the Galaxy A9 is priced at Rs 36,990 in India.